Last week, we had beautiful, picturesque views outside our office as the trees mostly finished their transformation into the autumn coloration the East Coast is known for. On one particular day, Andrew stood at the window actually dissecting the visuals as a rendering engineer! However, this week, and particularly today, we’ve started getting that terrible cold rain the East Coast is also known for, so the title of this update refers to the weather outside. Thankfully, we’re warm and happy in the office! And boy, are we being productive! We’re working through some big features, including building destruction with full server-side physics rubble, a 64 bit client which gives us access to more memory, as well as the changeover to Coherent for our UI. On top of that, Art is updating our characters to not only look better, but also animate better, while taking the same or fewer resources to render. 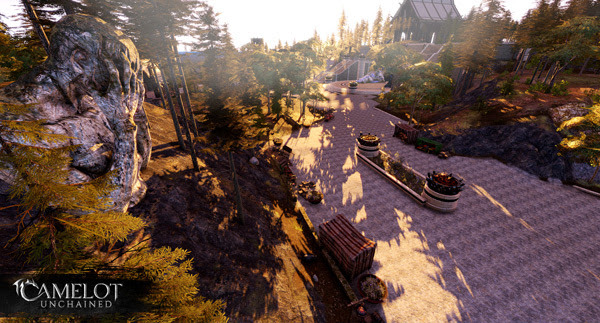 We truly have a lot going on right now in order to deliver some of the game’s bigger features. We’re looking forward to those particularly large battles that only our engine can deliver! If you missed this week’s livestream and Q&A with Mark, you can find that HERE. These streams are a great opportunity to interact with us, and to ask any burning questions you may have. Testing – We’ve been working on a lot of features that are pretty big and important, which often limits our ability to hold exciting tests. That said, once we complete these larger features, we’ll really need to ramp up testing to smash some bugs. We hope to CU for Beta 1 testing at that point! WIP – Tech – Rubble – Andrew and Colin have been working to integrate our “physicalized rubble system” with the building server and get that ready for review and testing. The building server will help us spin off some of the intense calculations in order to improve performance. WIP – Tech – Abilities – Rob and Caleb have been going the extra mile (or marathon, as Mark said on stream!) to get our ability system up to snuff. They’re fixing prediction and developing layers of gameplay to allow for Ben to build ability parts through the editor. We’ve made progress bringing those into the editor, and we’re now much closer than we were. WIP – Tech – Readied Weapons – As part of the equipment and skill system, Christina completed our first draft of readied weapons this week. Although we still have some work to get the UI in place to use this tech, we should have this in the game soon. WIP – Tech – Particle system – One of the major performance hits during Beta 1 has been in our particles system. Andrew had partially fixed this, and handed it off to one of our new team members: Wylie! He has been working to get some improvements polished and into the game. WIP – Art/Tech – Weapon Particle System: Mike planned out how we want to better support VFX on weapons, based off the improvements to the ability system. This will allow him to author more broadly applicable work (and avoid headsplosions), and let the improvements that Wylie will be tackling do most of the grunt work! Art will follow up by updating the weapons with more bones, based off Mike’s plans. WIP – Tech – Coherent + 64 Bit – As of this writing, George is mere hours away from completing our client conversion. Of course, then comes testing, updating, checking, and review – but the reality of 64 bit is going to happen next week! Coherent bug fixes are ongoing with Matt and JB, and that should wrap up shortly. Art – Characters 2.0: Better looking and more performant characters! WIP – Updated Armor: Jon completed the TDD Light and Medium armor improvements. Once these are all complete and the necessary tech is done, we can get them in the game. Three to go! 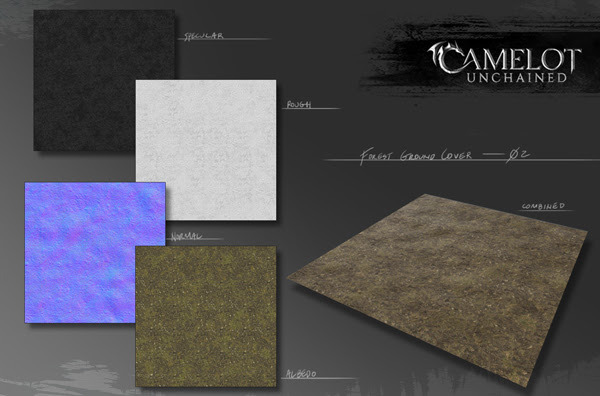 Male and Female Human UVs: Dionne completed the update to the female human UVs so they match the existing male UVs. This will be maintained moving forward with future races so that we don’t need to create unique textures per gender. WIP – Shared Casting Animations: Scott finished a lot of changes this week to the shared casts for animations. These changes were necessary to support the future variable timing improvements, and to make sure the casting animations stood out against the melee animations. Next step will be the “focus” and “wand” variations to the finished casts. 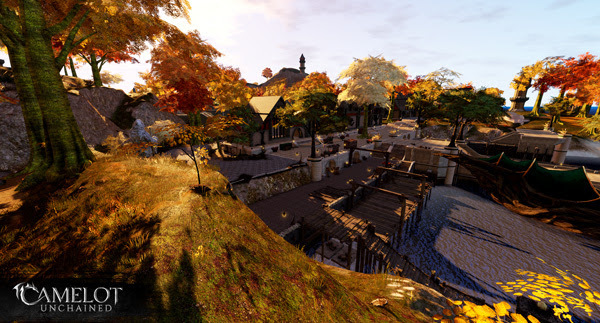 WIP – Shared Archery Animations: Sandra began work on the updated shortbow and longbow animations, with additional support for more robust timing changes from the ability system. These will also incorporate a visual for the “load” components, so players can see their character make changes to arrows according to their ability. Updated Animation Rigging: Joe updated parts of the new character rigs and bone picker to speed up the process of creating new animations for polearms and bows. WIP – UI – Crafting – Our work continued on the crafting UI updates this week, as we hammer out (get it?) some of the last details, AJ has been hard at work putting it together. If you have not seen the awesome art for it in previous updates, check it out! Tools – We don’t give tools enough credit, and they deserve an awful lot! This week, we did a lot of work to improve our development tools, with various bug fixes and editor support for skill building. Design – Classes – Ben has wrapped up his first pass on the Devout, and has now moved on to his first pass for Support classes. 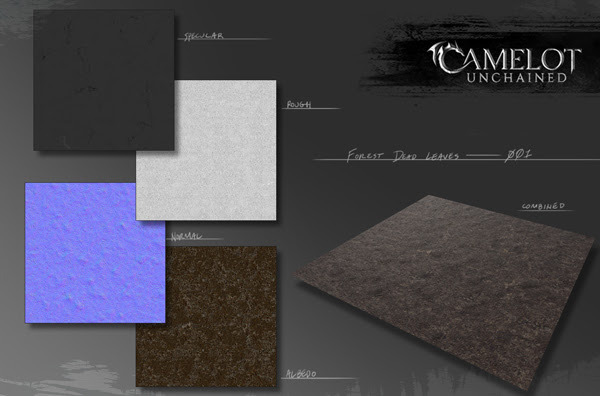 WIP – Updated UI Elements: James handed off an update to the in-game HUD for the scenario scoreboard, which AJ will implement. Meanwhile, Michelle is adding in more details to the health bars to show class archetypes. 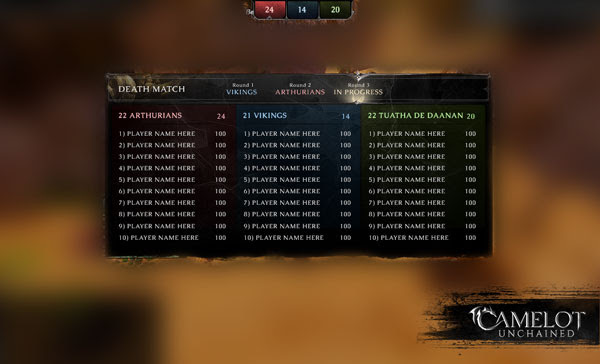 For art this week, we start off with the UI update from James on the scenario scoreboard. He turned this one around fairly quickly this week, thanks to the existing style guide work he’d previously finished. Michelle continues to help out on UI. You can see below some possible changes to the health bars to show class archetype. Scott continues to work through the new shared casting animations for mages. These will get us into testing sooner, and will be saved for more complex animations later. This static image shows off the importance of key poses in our animations. This week, outside of general art oversight and reviews, Tyler (that’s me!) found a few hours to create some new ground textures to further flesh out our world. These may be incorporated into some of the new work Dionne will be starting on next week. The character 2.0 update is a big and lengthy task to improve the existing character art. Once finished, this will free us up to begin work on some fun (and non-Human) races of CU. And now, I’ve pulled a few images from the home islands that we have yet to show off! 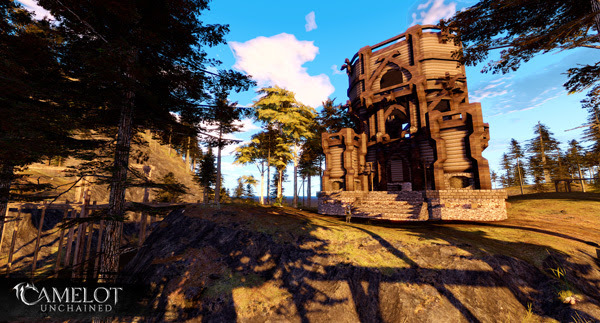 Dionne and I completed all the environment props and natural environment assets, while the Builder’s Brigade used our in-game building system to create the required structures. First off, a long shot down the TDD docks in Ériu. You can see the tail end of the TDD boat to the right, and towers out in the background! On the Viking home island, Midgard, Dionne created this great area of bridges between raised terrain around a central tower. 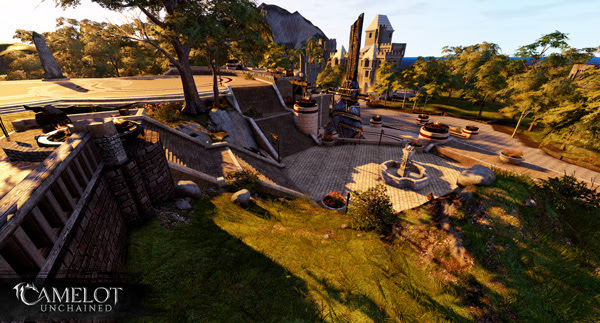 The second image is from the back side of the docks on Midgard, showing off the great tortured statue that Jon created. 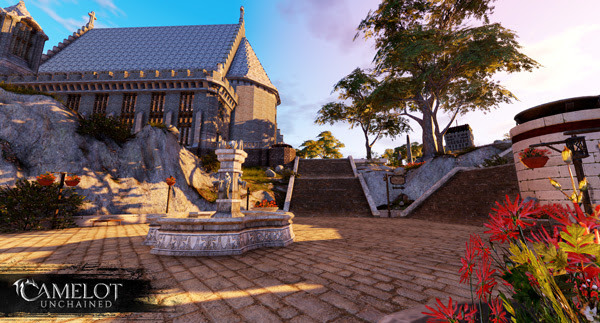 Finally, a couple of shots from the Arthurian home island, Briton, of the walkway up to the portals to go to the Builder islands, and the small adjacent courtyard with the (also player-built) Healer’s Hall in the background. AND THIS JUST IN! 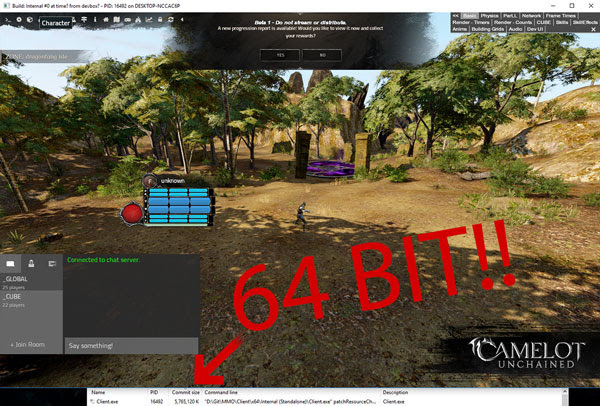 We’ve got the client running in 64 bit! Literally just before we were going to send out this update, George and Tim got the client up and running! Check out the memory usage in the image! That wraps things up for this week! I’m looking forward to the next several weeks before the end of the year, as we have a lot of buns in the oven that are almost finished baking! Thanks as always for your support!